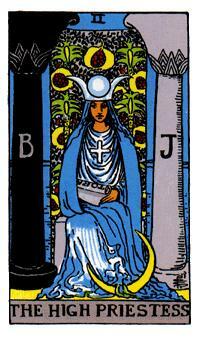 The High Priestess is shown seated confidently, at peace and filled with inner faith. She is surrounded by aspects that might be see-through or not quite solid, but not completely transparent either. The temple she sits in front of is sacred and hold the secret truths. She is the guardian of our deeper selves and she represents what cannot be entirely seen, that which we have faith in but cannot see or touch or feel. She almost lives on another plane, connected with deeper truths and hidden secrets. While these truths and secrets might be elusive, they are not unreachable, but we all need to find them for ourselves. The High Priestess is opposite to the Magician. Where the Magician is excited with high energy, the High Priestess is calm, and still. The power in both is equal, and they both match in importance. One pillar is light, one pillar is darkness, the High Priestess sits between them. The solar cross balances between masculine and feminine. The Number 2: balance between opposites, opposition, partnership, negotiation, choice. Looking inwards for guidance, listening to your intuition, and your dreams. Being open to things that are unknown to you, and looking past the superficial boundaries. Being patient, allowing events to unfold without interfering and being passive. Special Notes: The High Priestess balances out the masculine energies of the Magician and the Hierophant in different ways.